CanadaVet.com Blog: What's the Best Way to Train A Dog? We can't count how many times we've been asked "what is the best way to train my dog?" or "which is the best dog training method?". Unfortunately like so many things, there really is no simple answer to the question, and it's the simple truth that there are various ways to train a dog which will work, the question is will they work for your and your dog? What we do know is that there are some ways that don't work or which aren't appropriate, and of course, a dog with even a little bit of training is better than no training at all. While training your dog will be easier, it is simply not true that "you can't teach an old dog new tricks" so it's never to late to start dog training. working individually with a trainer. The first option is to take a class with your dog. If you think this option might work for you, talk to your vet who might be able to recommend a nearby trainer. Also don't forget to ask your friends and other dog owners which trainer they would recommend. 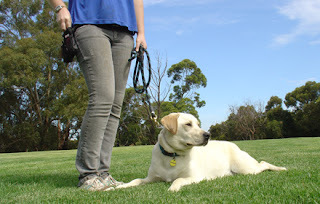 Dog training classes like this are usually available all year round and last from between 7 and 10 weeks. In group training, your dog will learn simple commands such as sit, stay and walking on a leash. Group dog traning is a good option if you feel your dog needs to get used to listening to you when their are other distractions about. For a second option, you can take your dog to a training facility either during the day (like day camp) or for a few weeks or months at a time. Someone else will then begin training your dog. Generally this isn't recommended but if you travel a lot or are simply too busy, it might be a dog training option you choose to consider. Your third dog training option is training your dog on your own. This can be very satisfying for both you and your dog, but remember, you'll have to stay focused enough to practice every day. Unless you've trained a dog before, you'll also want some sort of dog training program or plan, and there are lots of great books and DVDs out there that can help. Hiring a dog trainer for private lessons is a your fourth option. A private dog trainer is a good choice when you are having a behavior problem or a very difficult time teaching your dog obedience but remember it can be expensive. A good trainer will be able to customize the training and help you with any specific problems. Remember, which ever option you choose, training your dog will take time, commitment and love, but the rewards are a happier dog and a more satisfying dog/human relationship. Next week - what dog training methods don't work! CanadaVet.com has a great range of safe, effective dog training aids - click here to see them.